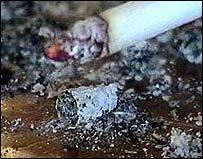 The majority of people in England and Wales back a complete ban on smoking in workplaces, a new survey has suggested. Action on Smoking and Health (Ash) and Cancer Research UK said 73% of the 1,000 people they surveyed said a ban should be applied without exception. The poll comes ahead of the Health Improvement and Protection Bill, due before Parliament in November. The government has proposed exempting private clubs and pubs not serving prepared food from the legislation. The poll also found that 85% of those surveyed would patronise bars and pubs at least as often if they were smoke-free. Cancer Research UK's chief executive Professor Alex Markham said: "The vast majority of people say they would still visit pubs if they were smoke-free. "This is supported by the experiences of places such as Ireland and New York, where there is clear evidence that going smokefree does not damage profits." Ash director Deborah Arnott said: "The public wants action to end second-hand smoke at work. "It now kills more than 600 people at work every year - three times the number of deaths from industrial accidents. And it causes many thousands of asthma attacks and episodes of illness. "The pointless and damaging exemptions for pubs and clubs must be dropped from the final Bill. Smoke-free legislation must be comprehensive if it is to be successful." The smokers' rights group Forest dismissed the survey as "complete nonsense". Spokesman Neil Rafferty said: "This poll is completely off the wall. It is totally different from other polls in the UK, which show that about two-thirds of people are very much against a ban on smoking in pubs. "Surveys show that most people do want to see further restrictions in public places - and we are happy to acknowledge to that - but the vast majority do not want an outright ban in pubs." He added that "people who want choice are winning this argument and the fanatics are losing it".